Uh... nobody. Not myself, not my husband, not my family, not my Weight Watchers leader, not even my surly, old cat! Even 6 small weeks ago running was a word I had deleted from my vocabulary. Okay, maybe not deleted, but it was a "dirty word." Something that only freaks and psycho athletes did. Even though I had lost 90 lbs I still NEVER EVER gave a thought to running as an exercise for me. Fast forward 5-1/2 weeks, and I'm running 4 miles at a time, and I'm less than 10 days away from my first 5k. This people, is monumentual. I remember back to school when I had to run in gym class. It was so bad, sometimes I would try and hide behind the bleachers sometimes for a few laps to take a rest. It hurt me. It sucked! I was overweight, and had a big chest, and running sucked!!! I hated my gym teacher, and I hated those kids that could run like the wind - that it wasn't even hard for. I wish they could see me now... I'd show them! 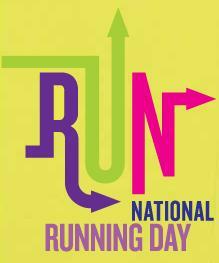 Will you celebrate National Running Day with me, with a run? And if you can't run, then how about a walk? A special shout out to several of you who have been visitng my blog regularly, and really encouraging me especially with the running. You can not even know how much each kind and encouraging comment helps me! Thanks!